Starting from the Dashboard you could see -> button just expand that you will get a list of menu. By default the "Facility tab" is shown. Simply choose on the Insurance tab to make more customizations. You can create an Insurance by clicking on “New”, this throws you a popup that allows you to describe the Insurance plan that you wish to add. Hit on "Save" to save the changes made. You also have the feature to Edit or Delete the Insurance created, Hitting on the "Edit" option allows you to make changes to the existing Insurance. If you wish to Delete the Insurance then click on Delete button. Click on + icon then click New button to add an Insurance coverage details. 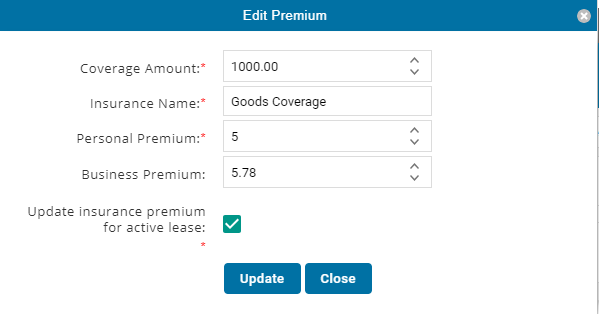 Fill in the details, If you enable the "Update Insurance premium for active lease" Then the updated price will be updated for the existing lease. Fill in the details and click on update button.